Typical, isn’t it? Last Summer we spent a weekend in a camping barn in the Lakes and had such glorious weather that we wished we were camping. This year, as a result, we booked into Great Langdale campsite. And the weather? Well, fortunately we’re not exactly inexperienced at putting tents up in pouring rain on a Friday evening, and everyone was able to squeeze into Pokey & Annie’s tent and porch afterwards. Saturday did not look a very inviting prospect for walking, with gusty wind, rain, and heavy grey skies. However a number were willing to brave the elements no matter what, and there was an optimistic belief that it would clear up in the afternoon. 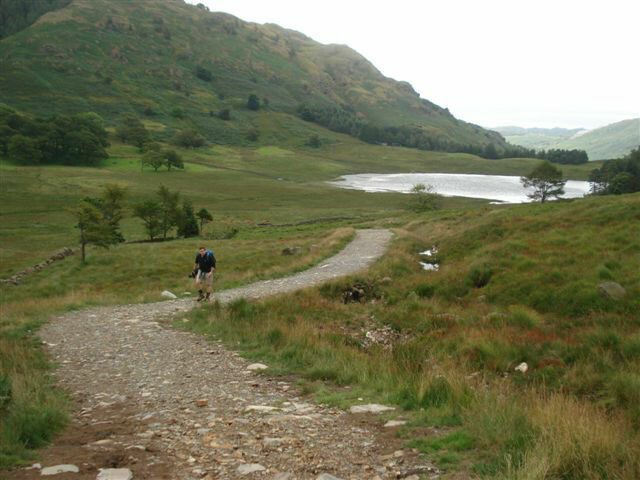 We set off from the campsite, aiming for Stickle Tarn and High Raise. 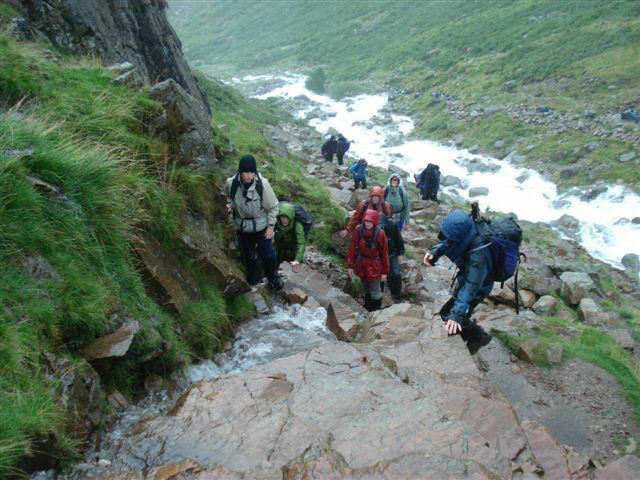 The first main part of the walk involved following the river, a stepping-stone crossing and scramble up the side of the waterfall. 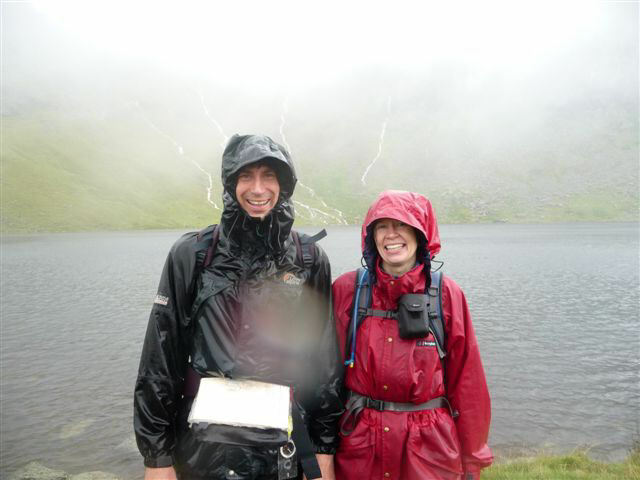 The volume of water and increasing rain added an interesting “edge” to the experience, especially given walkers descending from other directions, offering such gloomy advice as “well, it’s up to you…” Eventually we emerged on a plateau, at the side of Stickle Tarn. A real beauty spot which would have been well worthy of a stop and a paddle, if we hadn’t all been so wet already. The walk continued with a couple of detours and changes of route, due to water avoidance, and possibly the fastest lunch stop ever, sheltering under a ridge of rock (and an unwelcome return back to the elements, when we re-emerged). 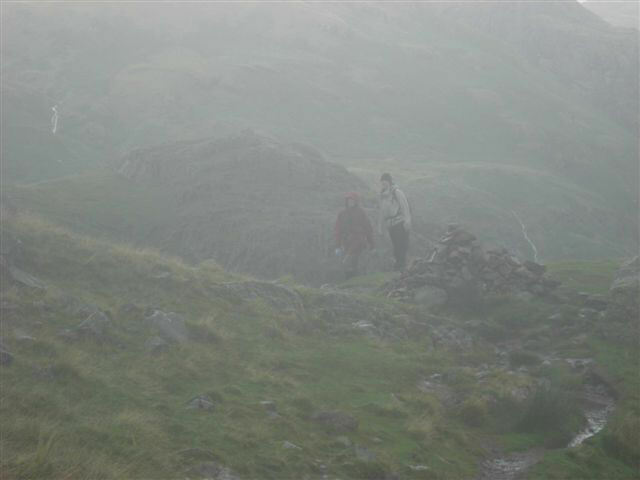 The highest point of the walk was reached soon after at High Raise (762m) which in good weather would have given us some of the best views in the Lake District (unfortunately our view was limited to 20 metres!) On cue, the rain finally stopped as we arrived back at the Stickle Barn pub… Time to relax with a beer and/or a warming glass of gluhwein. 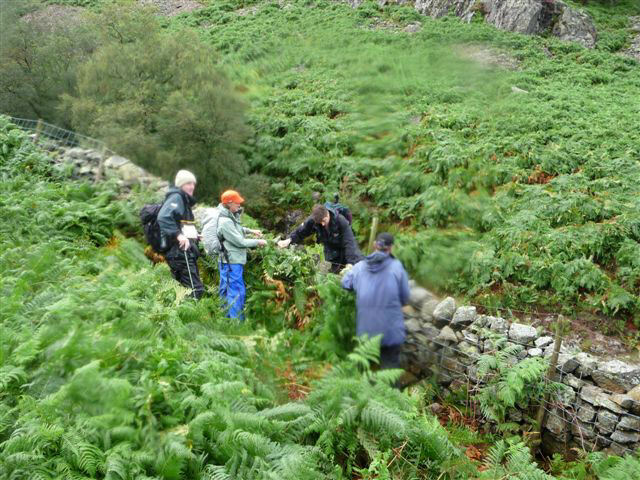 Later on, some people also convened in the Old Dungeon Ghyll for a few more drinks and perhaps a bowl of chips – by this time the skies were looking clear for an evening BBQ at the campsite. Some still decided that food in the pub was a safer and warmer option. We got a few fires going in BBQ buckets and did our best to stay awake until midnight to properly celebrate Bruce’s birthday. Paula proved once and for all that wine glasses don’t fit in the arms of camping chairs – still, the wine was Australian so she didn’t mind the spillage too much. Mick and Ange arrived late and pitched their tent right in the path of Pokey’s route from his tent to the bathroom block – however after a few beers, he didn’t really appreciate this fact until there was an unfortunate Pokey/tent collision, with swearing. The broken tent pole was anchored in place by a crate of the remaining beer. 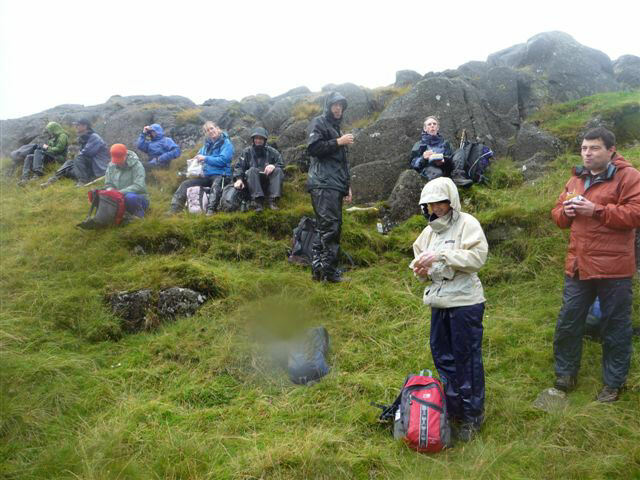 On Sunday morning the drizzle had returned intermittently, and there were also a few hangovers on display. 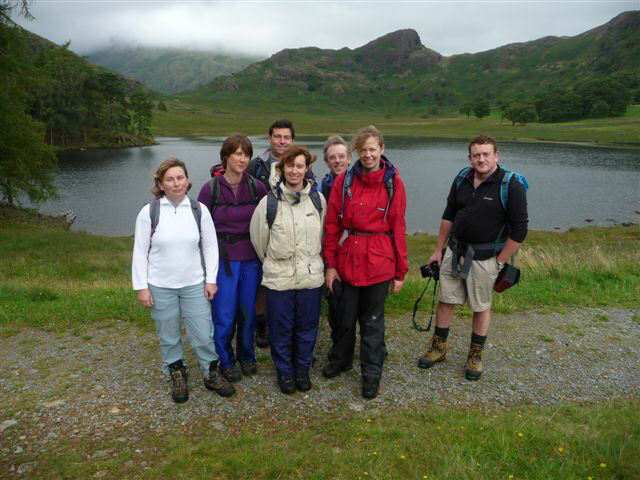 While a number of the group set off towards Blea Tarn and Bowfell, others decided that a low-level walk along the valley to a pub, or alternatively gear shopping in Ambleside, was the more favoured option.